The first step in installing turf needs to happen way before you even place the turf order – measuring. Using the Harden Park Lawns simple steps, calculating how many square metres of turf you need to order from us is a simple exercise. Divide up the areas into basic shapes such as squares, rectangles and circles. Measure each area and write down your measurements. Calculate how many square metres are in each area using the easy formulae list below. Add extra – for simple shape areas, order 5% extra and for more irregularly shaped areas, order 10% extra. Calculate the volume of turf underlay that you need. Measure one side of the square, then multiply it by itself. Measure the height and width of the square, then multiply them together. Measure the height and base, then multiply the height by half of the base. Measure the height and base, then multiply together. Measure the height and the top and bottom edges. Add the top and bottom edges together. Divide this figure by 2. Multiple by the height. Measure the width and height of the oval, then divide each measurement by two to calculate r1 and r2 (area =r1 x r2 x 3.14). Materials such as soil and sand are measured and ordered in cubic metres and tonnes so to calculate the volume of underlay you will need, work out the area in square metres, and then multiply by the depth to get the cubic metres. Usually you will need 100mm (0.1 metre) or 150mm of turf underlay (0.15 metres). Example 1 – You have a rectangle measuring 10m x 5m and need to add 100mm of turf underlay soil. 10m x 5m x 0.1m = 5m3. 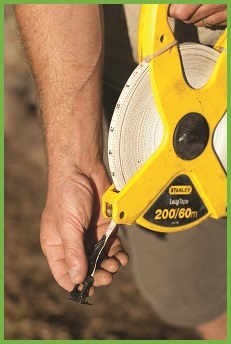 Example 2 – You have a circular area with a diameter of 15 metres and a radius of 7.5 metres, needing 150mm of soil. The area is 7.5m x 7.5m x 3.14 = 176.63m2. The volume is 176.63m2 x 0.15m = 26.49m3, rounded up to 27m3. You can order your turf underlay from Harden Park Lawns, for delivery along with your turf.